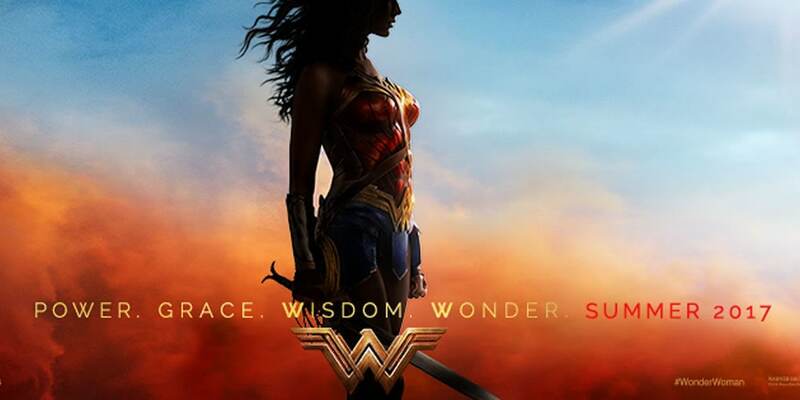 A few weeks ago Warner Bros. released the second trailer for the upcoming Wonder Woman movie – her first solo flick ever. The video is purely magical and has a lot of hints as to the plot of the movie. 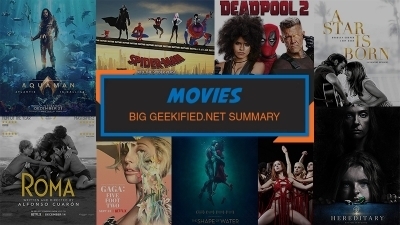 It took me a little time to write a proper analysis of the trailer, but before we go through it, let’s watch the material again – one can’t get enough of Wonder Woman, right? OK, we’re ready to go deeper. The trailer opens with shots of the Louvre Museum and the Louvre Pyramid. The latter, completed in 1989, suggests that these scenes take place in modern times and may serve as a frame narrative. 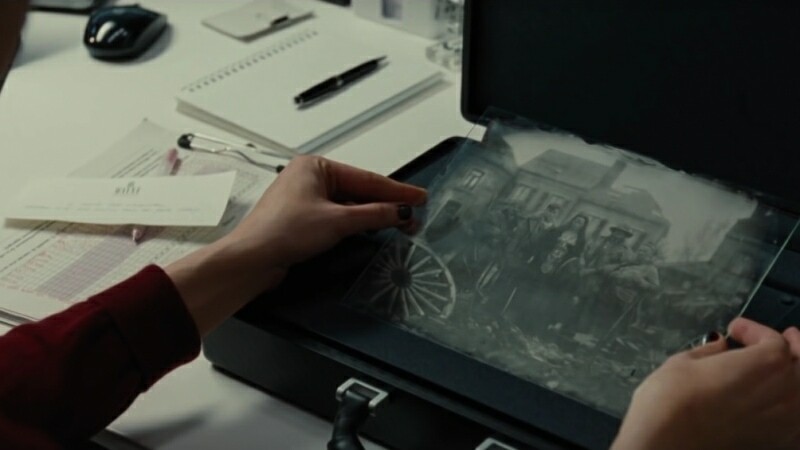 We also see our heroine looking at the photo we have previously seen in Batman V Superman: Dawn of Justice. Those of you who are eagle-eyed may also notice a note on the table which has a logo of Wayne Enterprises on it. And we hear Diana’s words: “I used to want to save the world…” It’s interesting that she uses the form “used to”, as if she doesn’t want to save the world anymore. Why is that? Well, let’s go on to the next scenes. 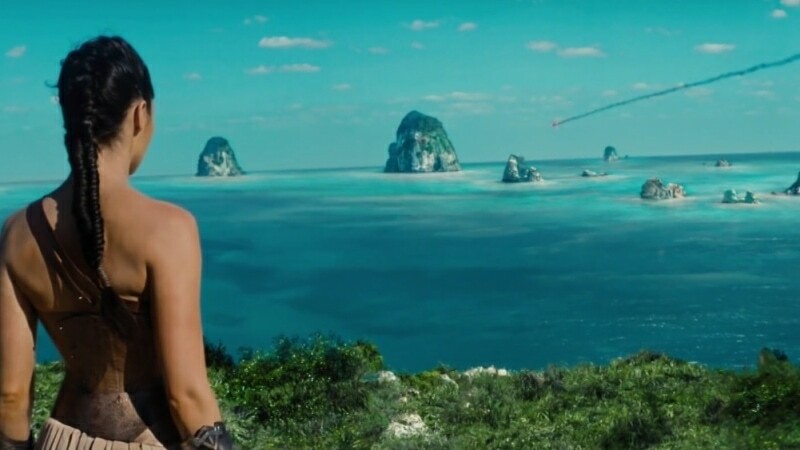 “…this beautiful place.” continues Wonder Woman over a shot of her watching the lovely ocean from the shores of Themyscira – the island of the Amazons. Suddenly she sees someone crashing into the water – a moment which serves as a warning that the idyllic life on the Paradise Island may be coming to an end. 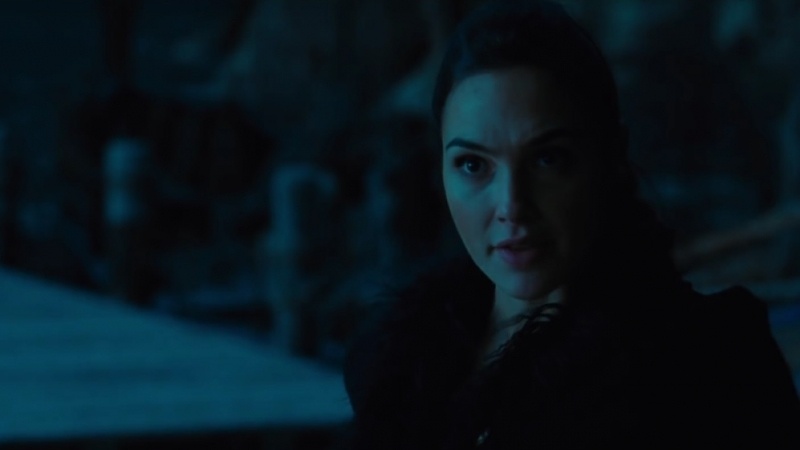 “But the closer you get,” says Diana “the more you see the great darkness within.” These words may explain her attitude in Batman V Superman, when she said “A hundred years ago I walked away from mankind. From the century of horrors. Men made a world where standing together is impossible”. 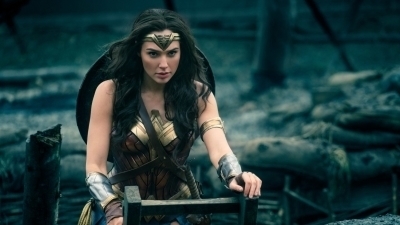 The Wonder Woman movie will hopefully show what exactly happened, but we may safely assume the horrors of World Wars (particularly World War I, during which the movie will be set) may have served as an important factor. Anyway, let’s not focus too much on what Diana says and let’s see what she does. 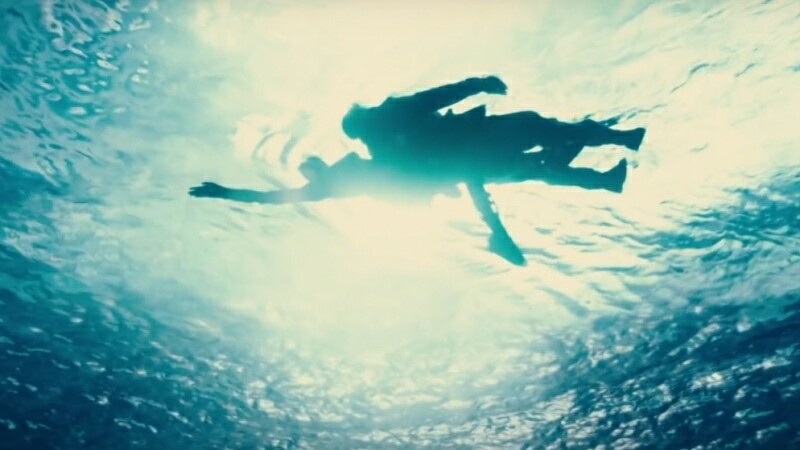 In the scenes over which we hear her narration, Wonder Woman jumps into the water and swims out with a body, possibly belonging to Steve Trevor (Chris Pine). From that moment the action intensifies and we now see a group of soldiers jumping out of a boat. Who are they? There is one visual hint – the letters on the boat say Schwaben, the German name of the country’s historical region, Swabia. 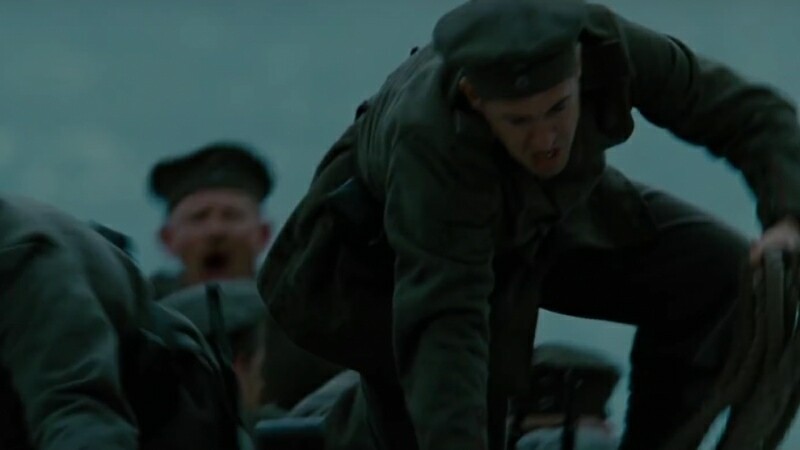 Knowing that the movie is set during World War I, we might assume these soldiers are on the side of central powers. Which, as you may figure, is definitely not a good sign. Time for battle! 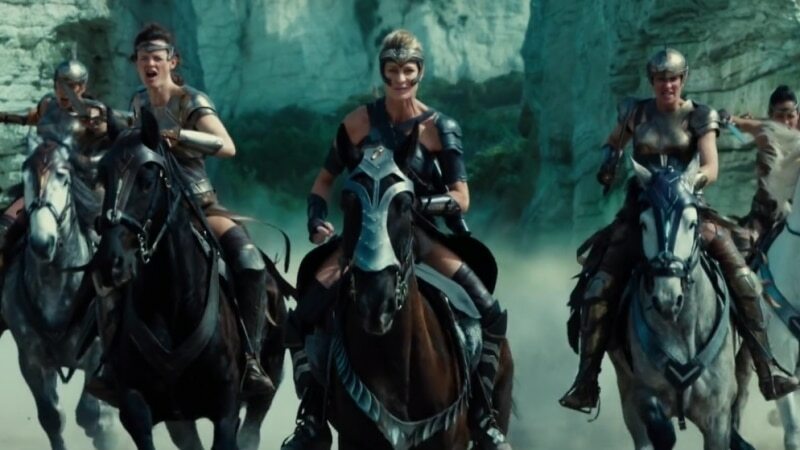 We see a big group of Amazons, led by the fearless general Antiope (Robin Wright), protecting their homeland island against the German soldiers. If anyone doubted that director Patty Jenkins could pull off action scenes (why would you, anyway – she’s such an amazing director! ), these shots will prove them wrong. 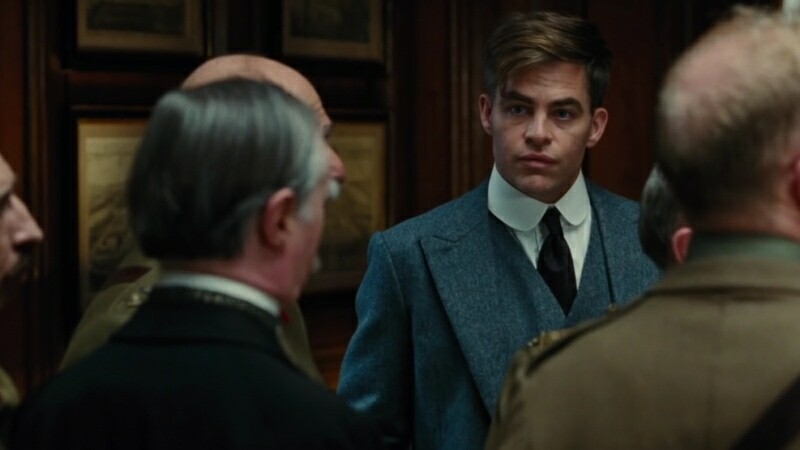 Steve Trevor comes before the Amazons and is being questioned by Queen Hippolyta (Connie Nielsen). “What is your mission?” she asks him firmly, only to hear: “To stop the war.” Diana, clearly intrigued, asks another question: “What war?” “The war to end all wars,” answers Trevor, with a tone of seriousness in his voice. He alludes, of course, to World War I, also called “The Great War”. It’s just a pity that he isn’t aware you can’t stop war with another war — there’s this little thing called “chain reaction”, Steve. And now, for the very intriguing part of the trailer. We hear Trevor off-screen, saying: “Weapons far deadlier then you could ever imagine”. And he keeps his promise, as we see… mysterious gas. 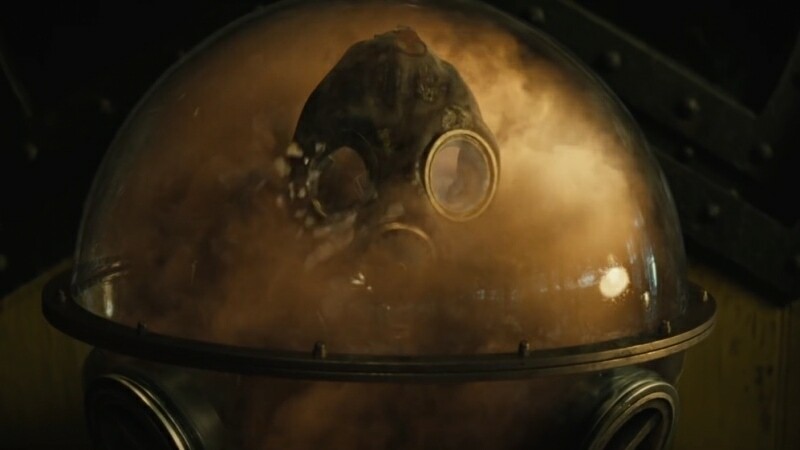 Gas which is so strong that it can even destroy a gas mask. 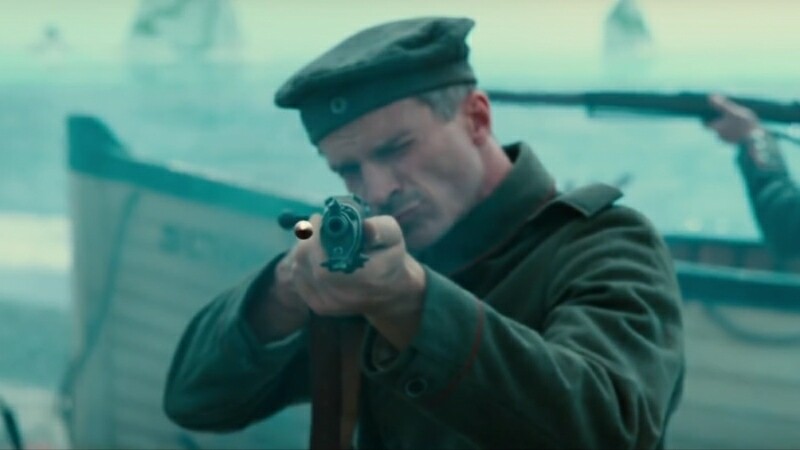 It is a nice allusion to the fact, that first bio-weaponry was developed around the time of World War I and a nice comic-booky hyperbole: making the weapon more dangerous and deadly than it was in reality. 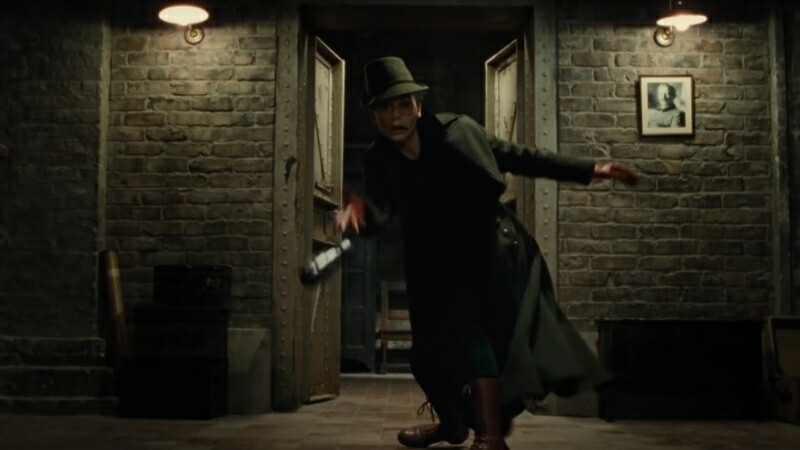 This is also the first time in this trailer when we see a mysterious villain wearing a mask (played by Elena Anaya). 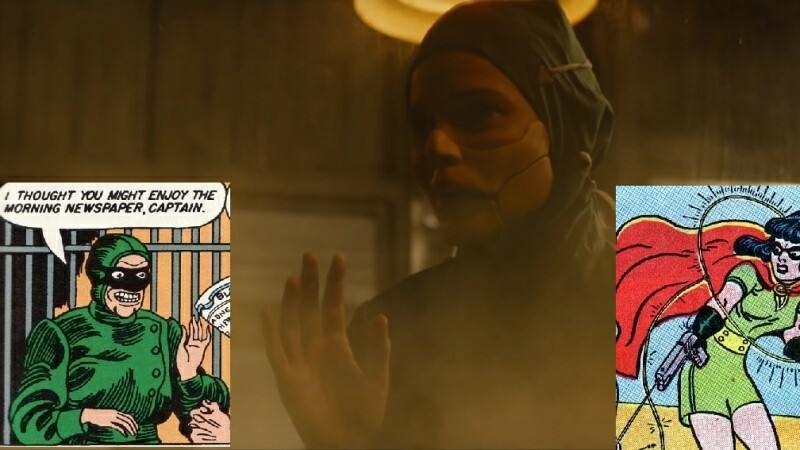 If you connect her with the gas, one particular Wonder Woman’s nemesis comes to your mind: Dr. Poison. But she is not the only one that could hide behind the creepy mask. Another likely candidate is Nina Close aka The Mask, who matches the profile not only because of her name and the fact that she covers her face, but also because of her modus operandi: she trapped her victims in rigged trick masks which would release hydrocyanic gas. We’ll just have to wait and see who the creators of the movie chose. 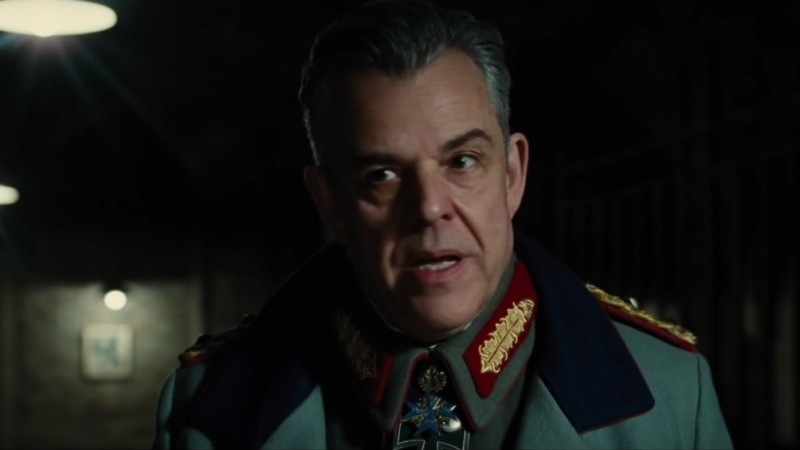 Oh, and let’s not forget a mysterious general (Danny Huston), co-operating with our female villain. We can hear him saying “The world can be ours,” which does not necessarily reveal a lot, but here’s one speculation: maybe he is disguised Ares, the god of war? 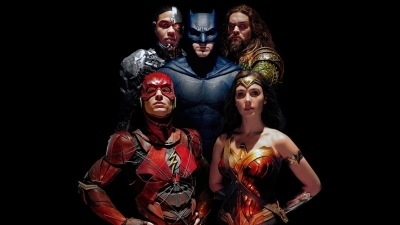 That would be by all means very interesting, although, on the other hand, it’s doubtful that Warner Bros. would like to introduce Greek gods to their “grounded” take on superheroes. And if you can get enough of the villains – worry not, because there’s more of them! First we see the mysterious woman throwing a stick grenade, and then we see a massive explosion with unusual, very bright light effects. If it was the grenade that caused the explosion, it’s clear that it was modified, possibly by the villainess herself. 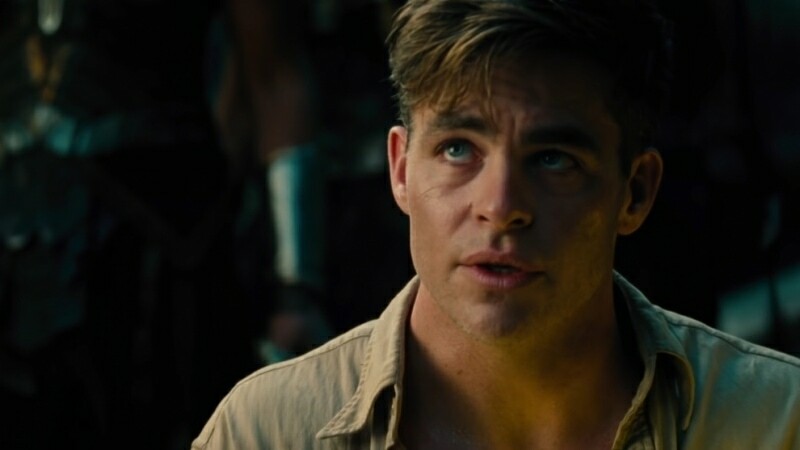 Oh, and after we’ve seen the impending danger with our own eyes, we hear Steve Trevor warning the Amazons: “Whoever you are, you are in more danger than you think”. 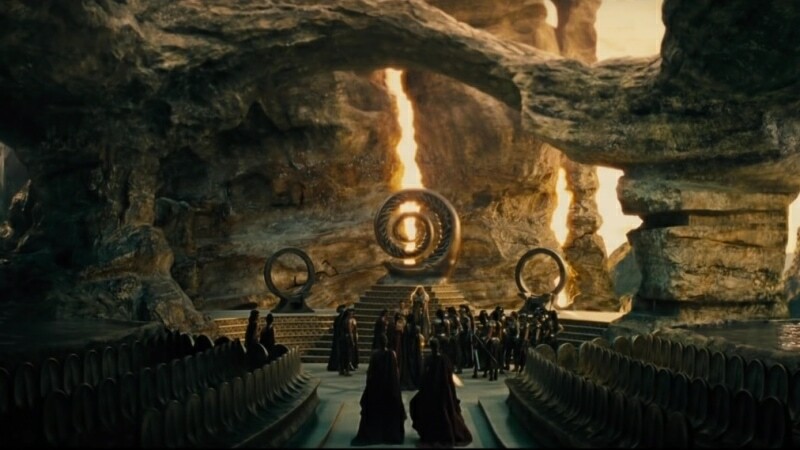 That might suggest Themyscira is – for some reason – being targeted by the bad guys. 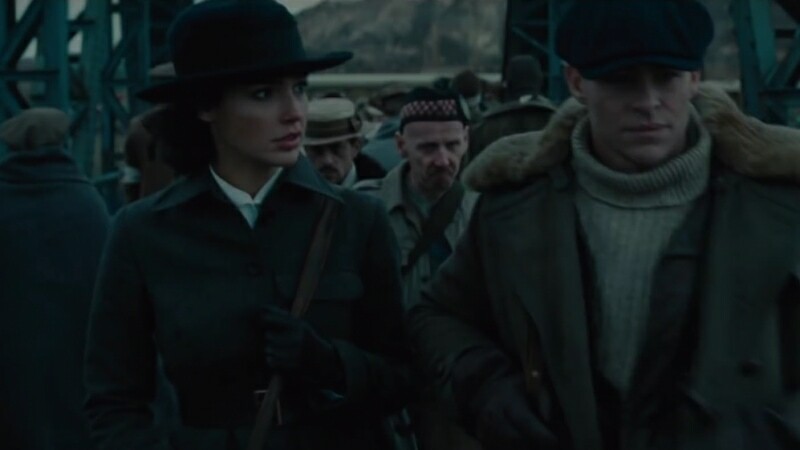 And so Diana and Steve arrive to the world of men. It was literally very masculine world, which serves as a good opportunity to highlight Wonder Woman’s feminist tones. First we get surprised and a little bit patronizing glances of a few men who look at Diana and ask Trevor: “Who is this woman?” He is quick to answer: “She’s my secretary, sir,” as if there wasn’t any better position for a woman that wouldn’t raise any suspicions. But as we know, Wonder Woman is so much more than a mere secretary, and it is shown in a scene that is a beautiful reversal of one of the moments in Donner’s Superman. A few armed men attack Steve and Diana, but she’s quick to react and — just as Superman did — deflects a bullet. And, of course, fights off the attackers. An action heroine saves a knight in distress – how’s that for a trope reversal? Of course, to add a comic value to the scene, Steve continues: “She’s a very good secretary.” Indeed, she is. 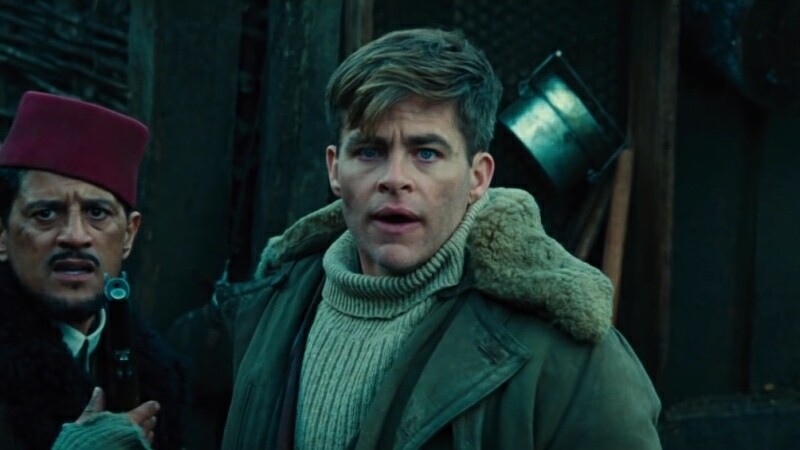 Protecting Steve Trevor isn’t Wonder Woman’s main mission, of course. It’s far greater. As we see her crossing a bridge, we hear: “It is our sacred duty to defend the world…” “Our” meaning “the Amazon’s,” it might be presumed. I wonder (pun not intended, I swear! ), why is it only Diana who takes this “sacred duty” seriously and decides to go out there, when the catastrophic war approaches. Anyway, Diana ends her sentence with the following words: “…and it’s what I’m going to do.” She then runs towards the enemy, which makes Trevor scream with terror (oh, Trevor, she’ll manage, don’t worry). It’s worth noting that next to Trevor there’s a familiar face of Saïd Taghmaoui, an actor whom you might remember from his role of Ceasar on Lost and/or Guillermo Ortiz on the very underrated Touch. As of now, it is unclear who he is gonna play here, but he’s definitely gonna be a good guy – which is great as it’s a rare opportunity for guys of his ethnicity. And what comes next is a set of action scenes intertwined with a few more intimate moments between Diana and Steve Trevor. 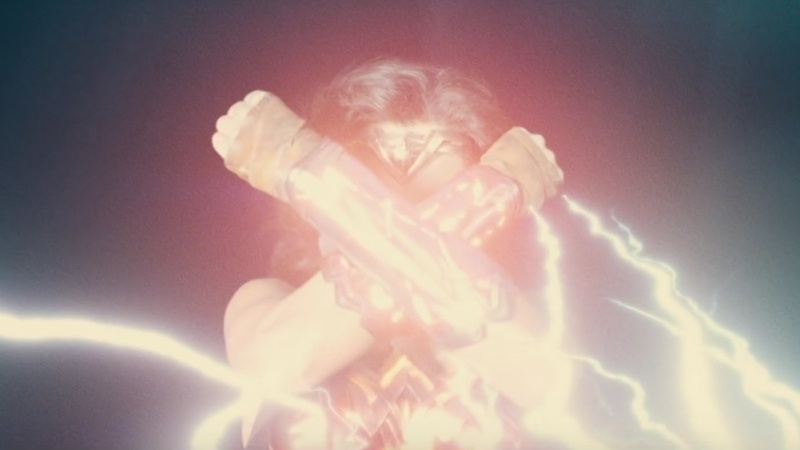 We see Wonder Woman deflecting bullets in slo-mo, fighting bad guys (including the general and the masked woman, both mentioned above), using her shining lasso and bracelets, riding horses and motorbikes and, you know, being awesome. It gets more and more intense, until we see the logo and hear the music theme from Batman V Superman. The last scene is designed to make the audience chuckle a little bit, just like in the previous, comic-con trailer. The comic relief is again centered around the character of Etta Candy and beneath the laugh there’s also a theme to ponder about. Basically, we see Diana trying on a dress. She doesn’t seem really happy and asks Etta: “How can a woman possibly fight in this?”. The humorous redhead is quick to answer: “Fight?! We use our principles. 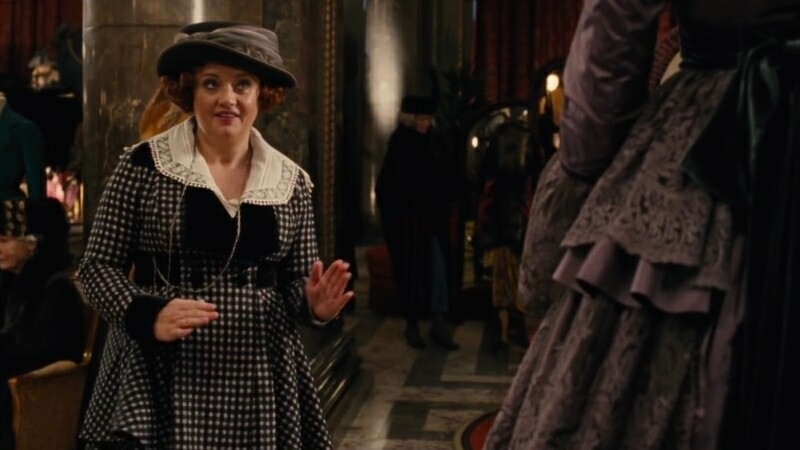 Although I am not opposed to engaging in a bit of fisticuffs should the occasion arise.” Oh, it’ll be a great movie for Candy’s portrayer, British actress Lucy Davis! And that’s it, guys! I’m totally in love with this trailer and Wonder Woman is definitely the superhero movie I’m waiting for very impatiently. 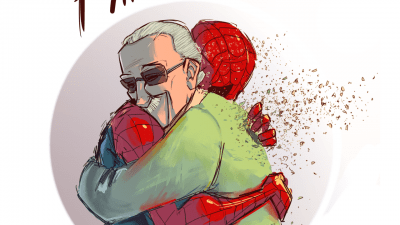 I really hope we’ll get a good motion picture that will be loved by both fans and critics. 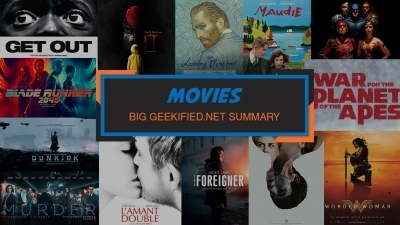 And from what we’ve been shown – Warner Bros. and co. are on good track for that to happen.